Oh boy, these first few days have been a major learning curve for both me and the pup. I actually decided to wait a bit to write my first trail update. The start was really rough and I didn’t want to share my first update in such a negative and defeated state of mind. 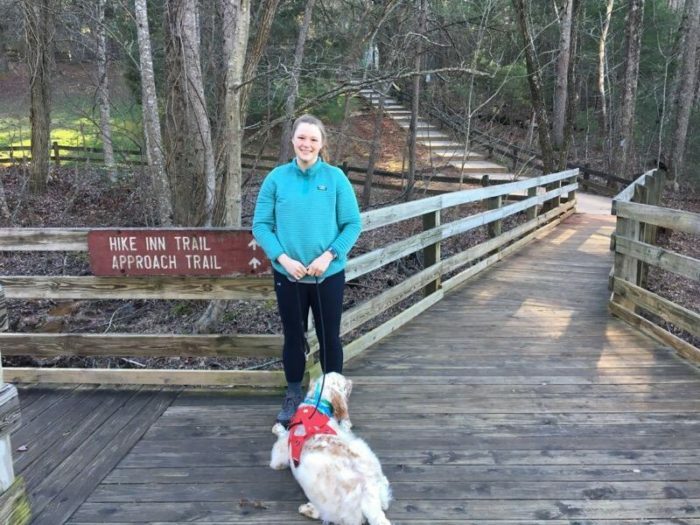 Before you quickly scroll through to find out what sort of embarrassing trail name I have earned, I’ll warn you that I’m still just plain old Dayze on the trail. No trail name yet, but I’m sure I’ll do something dumb and earn one before my next post. Without further ado, here is what my first eight days on the trail looked like. Our very first day was hard. 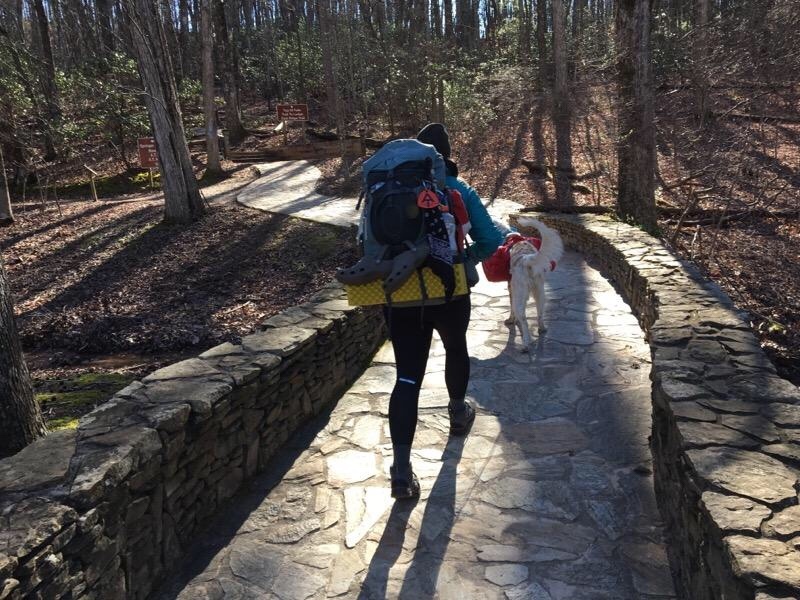 Flynn and I did the 8.8-mile approach trail from Amicalola Falls State Park to Springer Mountain, which is the Southern Terminus of the Appalachian Trail. I was warned that it was a tough, but DANG it was a real doozie! The trail consisted of several flights of stairs, which poor Flynny wasn’t fond of, followed by steep hills up to the mountain. But believe it or not, the hike was the best part of my day! This was actually the trend for the first five days; the hiking was great, but the nights were completely miserable. As much as I’d like to straight up blame the weather for the miserable nights, it was actually due more to my gear choices and the weather expectations I had for Georgia. It has been much colder than I expected. Luckily, I’m not the first thru-hiker to make this mistake, and I certainly won’t be the last. For our first night in the mountains, the temperature was 27 degrees Fahrenheit, with 35-mph winds. I clumsily tried to make a hot meal, which I didn’t cook long enough, so it was very crunchy, watery, and overall pretty terrible. I honestly wasn’t even hungry anyway. 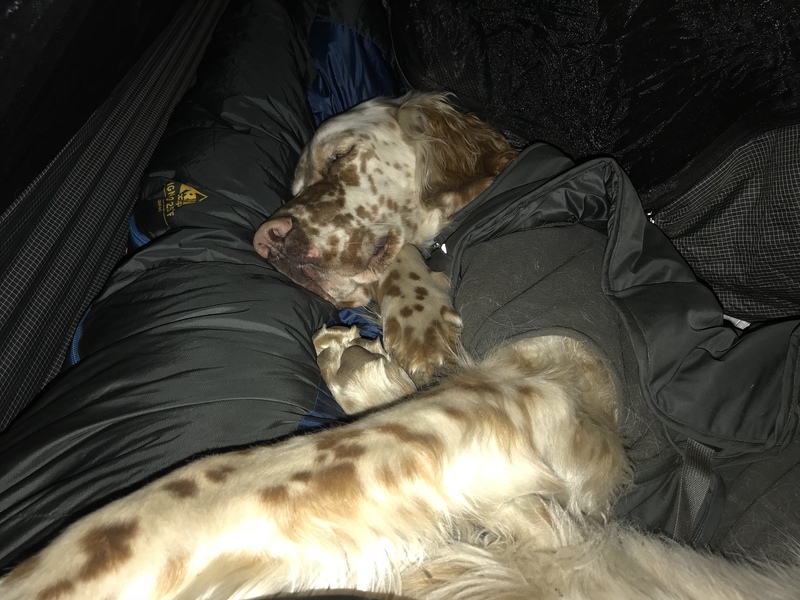 When it started to get dark, I climbed into my hammock and set Flynn up with two jackets, a tarp, and sleeping pad to go underneath the hammock. You’ll see pictures of the setup below. Instead of sleeping, I shivered. I was wearing every single article of clothing that I had packed, and I was freezing. Flynn was crying underneath me, and he was also shivering. The wind was pelting him with sticks, and he looked totally scared and gloomy. It was like a dramatic scene out of a movie. I pulled him up into the hammock in hopes that we would warm one another. We both shivered all night. I don’t think we even got a wink of sleep between the cold, and the fact that my rain fly kept blowing open. I’d have to run out into the cold and reattach it to the nearby tree since the stake got ripped out of the ground by the wind. That stake was never to be seen again. Between those two things, along with the paranoia of bears, it made for one of the longest nights I have ever had. Maybe even the longest, to be completely truthful. So yeah, enough complaining, you get the gist of the whole thing. We were cold and we didn’t sleep for the first five days. Good news everyone: it got better. Seriously, no sarcasm here. We made some gear changes, and we made some social changes too. My thought was this: if the hiking is the easy part, then I can make some changes to the camping part. After that, everything should fall into place. –I started interacting with my fellow hikers. We sat by the fire, ate meals together, and planned on where we would be shooting to camp the next day. Having a bubble of familiar faces makes living in the woods feel a lot more like home. –I changed from my hammock to a tent. My first night in the tent made me feel like I might actually be able to do this thing. It suddenly made Katahdin seem reachable. It instantly changed my mind-set. It’s amazing what one great night of sleep can do for your attitude. 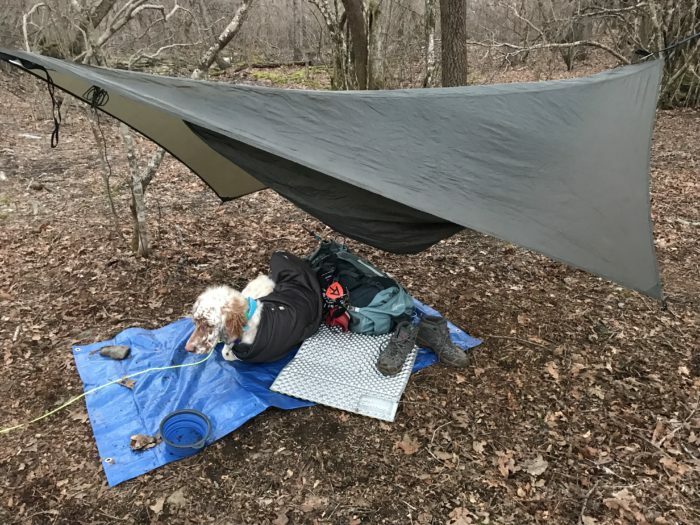 –I started to embrace the routine: wake up when the sun comes up, pack up your stuff, hike, collect water, set up camp, eat, brush your teeth, hang your bear bag, sit by the fire until it becomes dark, go to bed, and repeat. –I became more confident in my abilities and less afraid to look like I had no idea what I was doing sometimes. That’s great bonding material, when two people both feel like idiots and can laugh and learn from one another. Good stuff. There are still more changes that I need to make. 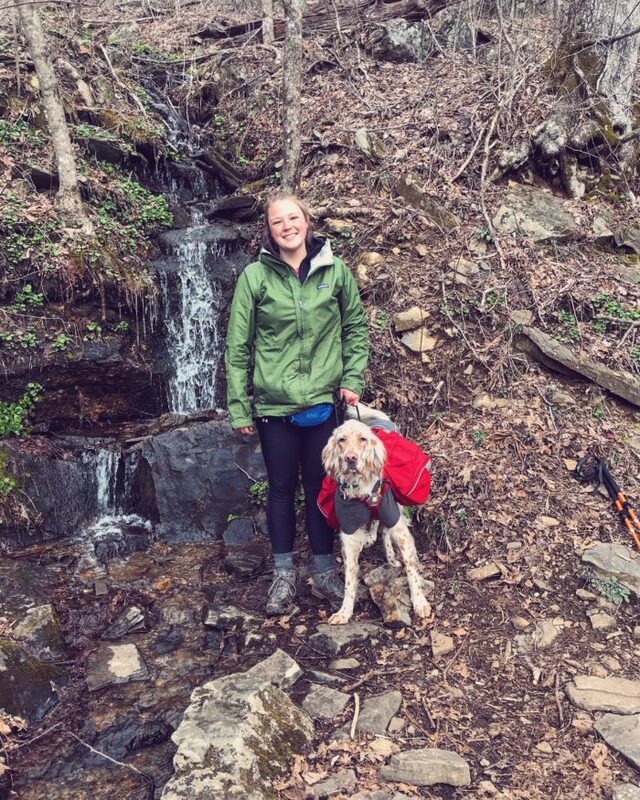 Flynn and I got completely soaked and freezing during our first rainy-day hike through Blood Mountain to Neels Gap. Flynn was verging on hypothermia and I was incredibly cold and wet, too. All of my hiking cohort hit the cabins and hostel there, but unfortunately none of them were dog friendly. Flynn and I had to hit a hotel that night. I was at a breaking point. Between not sleeping for five days, not eating more than a few protein bars each day, and feeling guilty and horrible for letting Flynn get so cold and wet, a hot shower and good night of sleep at a hotel were just the things I needed. It helped me take a step back from being in this intense, emotionally charged mental state, and allowed me to analyze what was working well, and what needed to change. I realized that as silly as it may seem, Flynn, like me, needs rain gear. I’m not sure if anyone has doggy raincoat tips, but I am planning on making one out of a garbage bag, or maybe a large kids’ poncho or something. 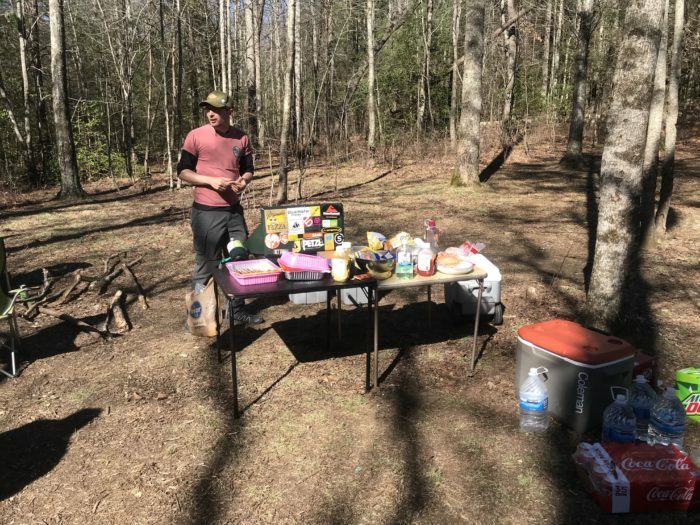 I got my first taste of trail magic on day three, and trust me, it was worth walking an extra mile at the end of the day for a Coke and a hot dog. 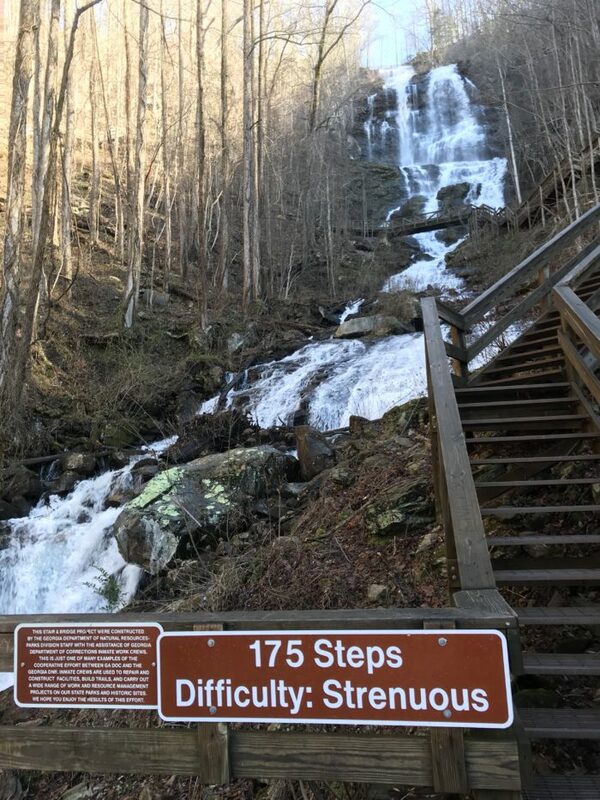 Plus, the advice and motivation from previous thru-hikers helped carry me for several days. –A sitting log is one h away from a shitting log. –It is the people and the relationships that make the AT so powerful. The first one is pretty self-explanatory; look before you get your feet too close to a log that looks comfortable to sit on. The second piece of advice has been one that I’ve been thinking about each day. Truthfully, I occasionally forget that I’m doing this hike for me. I forget that it’s OK to listen to my body and not push for massive miles, especially at the beginning. I forget that it’s not cheating to take two days off from the trail and recoup both physically and mentally at a motel when the weather is supposed to be really poor. I forget that when a group of guys tries to make me feel selfish for bringing my dog along on this hike, that I don’t have to listen to their opinion. I forget that this is my hike for me, and I can chose to do it however I please. That last piece of advice about people making the AT a powerful and fulfilling experience, I know touched on it earlier, but being shy and isolated stinks. Taking the time to talk to the familiar faces around you, and building trust and friendships, is what seems to keep people motivated to continue pushing toward Maine. It makes your hike fun when you have friends along the way. 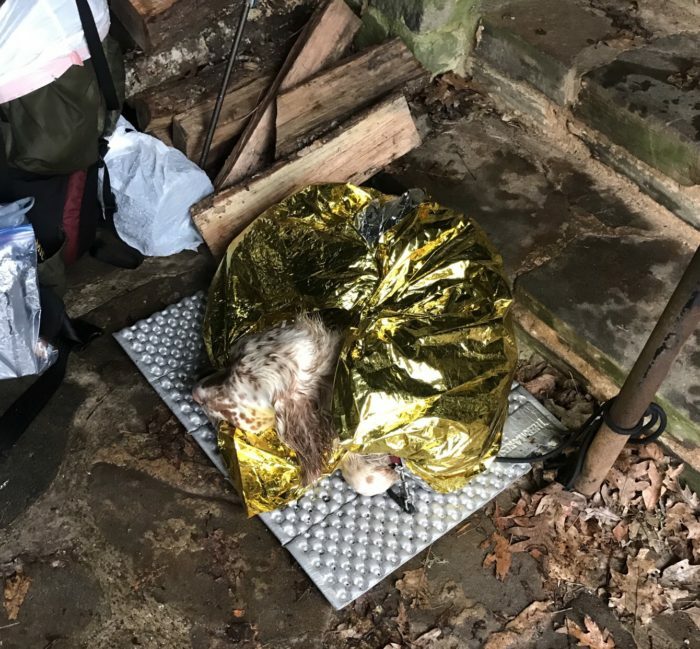 I just wanted to mention a couple of nifty things that I learned about from a thru-hiker the night before I left to start my hike. I’ve been using these basically every day during my hike. 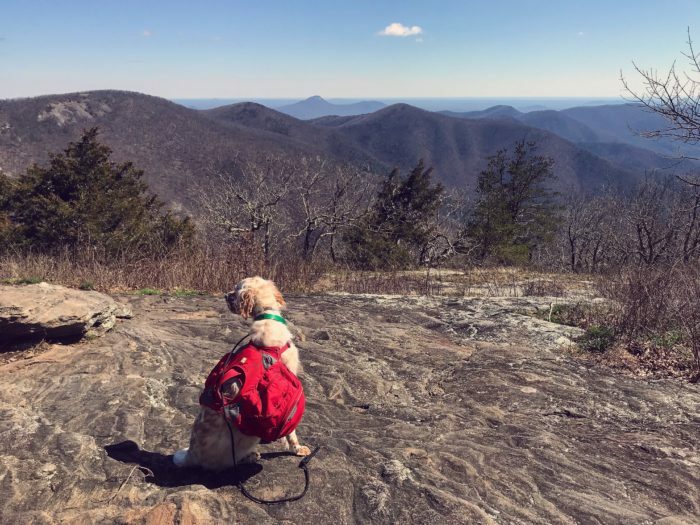 Guthook: This is an app you should check out if you are going to hike the AT. It’s a little expensive but it is basically a virtual guide of the entire Appalachian Trail. It has GPS that works on airplane mode so you can see exactly how far away you are from water, shelters, road crossings, etc. Hikers can also leave comments about whether there are bear boxes, information about the streams, or any other updated and useful information that hikers should be aware of. It’s been a lifesaver for me. Weather: This website gives you the specific weather conditions at each shelter along the way. It’s nifty because it takes elevation into account and gives a really accurate forecast. Alright, that’s it for now. Here are a few more pictures from the past couple of days. Hang in there an keep up the positive attitude. I’m also a Trek blogger and starting my thru next week, with my dog Dixie. I found your previous posts on dog care to be very helpful. Stay tough and keep adapting! Ahhh my little chickadee 💜 I am so proud of you for doing this! I look forward to reading your blogs and updates. Mama hen is proud of you and just remember all of the camp stories and memories we made 🙂 I love you and again I am so proud of you! Keep your head up and mind open so you can capture this wonderful journey! Dayze: YOU got this! I’ll be following you and Flynn! Please let us know if you need anything! Dayz – I have watched you grow into a truly amazing, inspirational, intelligent and driven woman. Your experiences, good and bad, will make this forever life changing. Maine is waiting for your return – but in the interim, collect as many memories as possible. Very interesting trek enjoy n stay safe! Definitely check out Hurtta for dog coats. They’re a bit expensive but the quality is worth it. The coat covers belly, legs, and neck. I got one in bright orange for safety. Can put the harness under or over depending on needs. I also like that it has no lining so I have layer option for the day, same as me. Hi! I am a friend of your mom’s. And what I think u doing is amazing. You are strong. And having your done g with u is amazing as well. Good support. For both of you. I wish u guys nothing but the best . Enjoy it and take all in . Alot people take life for granted. And all the amazing thing u can do with it . You by far have done it . Good luck to you and Flynn. Trail name for the team ? How about Flayse ? So sorry to read about those first days Dayze, and SO glad you and Flynn are past that hurdle! Wow!! I’ll be thinking about you guys and looking forward to the next update. You’re doing an amazing thing dayze!!!! Keep up the positive attitude! !